What Will I Learn in an Online Human Resources Program? What Are The Best Associate in Human Resources Programs? What Can I Do With an Associate Degree in Human Resources? The human resources division of companies and organizations manages recruitment and hiring, training and development of employees, compensation and benefits, and labor relations. Human resources professionals enjoy working with people and possess excellent communication skills. According to the Bureau of Labor Statistics, human resource specialists and human resource managers will see a 5% and 9% increase in job prospects, respectively, within the next decade. 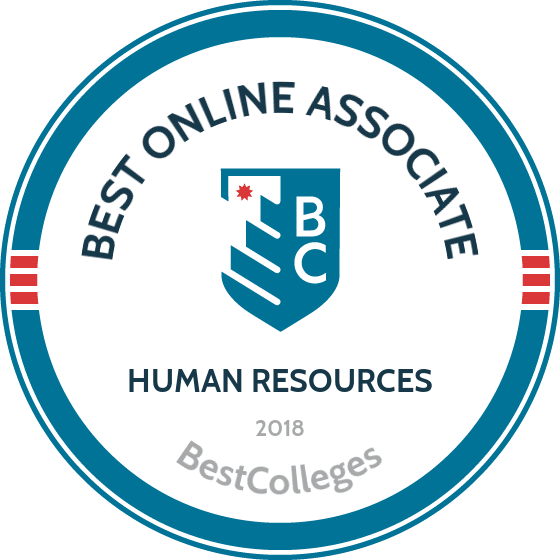 If you would enjoy a career conducting interviews and consulting with executives about hiring strategies and compensation, now is the time to pursue an associate degree in human resources online. Curricula of online human resource associate degree programs vary by school and concentration. However, most programs cover foundational topics such as regulations and management, hiring and dismissal techniques, recruitment strategies, training programs, and employer-employee relations. Below are three courses common to most human resource associate degree programs. This course covers the basics of calculating payroll, ensuring employees are compensated on time, and managing benefits such as healthcare and retirement plans. Students explore the processes involved with internal training and development for employees. Course material draws on instructional design theory and practice to teach students to develop, implement, and evaluate training initiatives and programs. This course provides an overview of skills necessary to manage day-to-day human resource operations, such as managing workflow and personnel, hiring and dismissing employees, and overseeing training development. CUW enrolls approximately 2,400 distance learners who can choose from an assortment of high-quality programs, including the associate degree in human resource management. Students earning this degree receive instruction from industry professionals who are well-versed in cutting-edge employment practices. The 64-credit online program includes the study of compensation and benefits, training and development, employee and labor relations, and change management. Students also learn about organizational operations through classes on management principles, intercultural communication, and social psychology in the workplace. To graduate, students are required to complete an integrative project that examines HR initiatives using social, legal, ethical, and management approaches. Upon completion of the associate degree, students are qualified to become HR managers, employee relations managers, or compensation and benefits managers. Admission requires a high school diploma or equivalent. Online students can start the program at any time. MSCTC offers online learners two associate degree options in human resources that can be taken on-campus, fully online, or in a hybrid format. The 60-credit AAS and AS degrees immerse students in the study of communication, policies and administration, employee recruitment, record keeping, wages and salaries, and benefit administration. Whereas the AAS program prepares graduates for entry- to mid-level positions as HR professionals, the AS program is a transfer curriculum for students planning to enter four-year colleges. Both programs have small class sizes to facilitate learning and one-on-one instructor interactions. Admission requires a high school diploma or equivalent along with transcripts. MSCTC has partnerships with several institutions to make it easy for students to enter bachelor's degree programs. The school also has several campuses across Minnesota and hosts a chapter of Student Human Resource Organization to help students network within their respective communities. STC has a catalog of 32 online programs including the 61-credit associate degree in human resources. Coursework in the two-year program includes the study of HR management, labor relations, employment practices, HR laws, organizational behavior, and benefits and compensation. Graduates of the program can go on the become human resources assistants, employment specialists, or benefit coordinators. The program also prepares students to take the Professional Human Resources exam administered by the HR Certification Institute. Courses are delivered through Blackboard in classrooms with a 22:1 student-faculty ratio. Online students have access to resources such as one-on-one advising, tutoring through video chat, and transfer services. The school is affordable and offers a full suite of financial aid options including grants, loans, and scholarships. Admission into the program requires a high school diploma or equivalent along with transcripts. Montana's leader in online higher education, MSU's Billings campus offers an AS in human resources that can be taken anywhere and at any time. The course of study in this 60-credit program includes classes in payroll accounting, employment law practices, safety and security, training and development, and compensation strategies. The human resources associate degree program is offered fully online or in a hybrid format. On top of core classes, students must complete an internship or participate in a practice-based workshop. Online learners have access to an online library catalog and online tutoring through the school's Academic Support Center. The school also helps students secure internships in the region through its career services office. Admission requires a high school diploma or equivalent. Students who reside in a state that participates in the Western Undergraduate Exchange Program qualify for reduced tuition. Cuyahoga Community College, also known as Tri-C, offers an online associate degree in business management with a concentration in human resources. The school allows students to complete the program fully online or in a hybrid format. Within the human resources concentration, students study labor relations management, business law, workers compensation, HR law, and advanced HR practices. The 62-credit associate degree in human resources online program also equips students with general business knowledge in areas such as accounting, micro- and macroeconomics, math, marketing, and computer applications. Admission into Tri-C's human resources associate degree requires a high school diploma or equivalent. The school accepts transfer credits from regionally accredited colleges. The school notes that its tuition is the lowest in Northeast Ohio and among the lowest in the state. A full suite of financial aid options are available including loans and grants. The program's online courses are offered through eLearning. Human resources departments exist across industries, in settings such as government agencies, schools and universities, restaurants, retail stores, transportation companies, manufacturing companies, and other corporate enterprises. Human resource jobs differ slightly by industry, but each division deals with recruitment, hiring, dismissal, training, and compensation. Human resources professionals may specialize in areas such as recruitment, payroll, or training. Personality type often determines the particular aspect of human resources an individual pursues. For example, someone who enjoys dealing with numbers may become a payroll accountant or analyst, whereas someone who enjoys teaching and communicating may become a training specialist or developer. Below are three positions commonly found in human resources departments. Training coordinators create and implement training programs for incoming and current employees. Depending on the size of the company, training coordinators may be responsible for the entire training process or for a certain step, such as design, implementation, or evaluation. Payroll managers oversee the processing of payments to employees. Responsibilities include checking payroll calculations and conducting administrative tasks concerning employee paperwork. Payroll managers are familiar with accounting and data entry practices. Human resource managers plan and coordinate the daily operations of the human resources division, including recruitment, hiring, training, compensation, benefits, and dismissal. They ensure adherence to internal and federal policies during dealings with employees. While graduates of an associate degree in human resources program are eligible for entry-level human resources positions, many upper-level positions require a bachelor's or graduate degree, which means further education is crucial for advancement in the field and increased earning potential. A payroll specialist requires a human resources associate degree and makes an average of $46,833 per year, while a payroll manager requires a bachelor's degree and makes an average of $62,604 per year. Below are three bachelor's degrees that result in advancement and increased salaries for human resources professionals. Psychology: Psychology is the study of human thought and behavior, specifically how thought affects action. A bachelor's in psychology commonly leads to counseling positions, both at schools and in private therapy practices. However, this versatile degree is useful in any position that requires communication and critical thinking skills. Business administration: A business administration degree provides a foundation in business theory and practice, covering the basics of finance, accounting, marketing, and supply chain management. Since human resource divisions often function within the larger organizational structure of a business, a background in business administration is highly applicable, especially to management positions. Accounting: A bachelor's in accounting is useful for those planning to pursue careers in payroll and compensation. Accounting programs teach students to process and communicate financial information. Human resources professionals typically grow their salaries over time. As the chart below demonstrates, managerial and director positions have the highest growth potential based on experience. A payroll specialist's salary may increase about $7,000 over 20 years, while a human resource director's salary may increase by $40,000. However, careers in human resource departments provide ample room for upward mobility. For example, a payroll specialist may advance to payroll manager after a few years. Regardless of position or employer, experience in the human resources field impacts an individual's salary. The table below shows the average salaries of training coordinators, benefit specialists, and other human resources staff according to experience level. Human resources professional organizations provide students and professionals with leadership opportunities, networking opportunities, training and development tools, and career support. Through professional organizations, students may access scholarships, essay contests, and research presentation opportunities. These organizations help working professionals earn promotions, find new jobs, and further their training in the field. Below are three well-known human resources professional organizations. The HRPA protects HR professionals by regulating and promoting ethical compliance in the field. The HRPA provides professional development and certifications, and it hosts an annual conference and trade show. As the largest international human resources professional society, this organization provides its members with news and trends in the field, certification preparation and exams, resources and tools on HR topics, and student and career development. The NHRA facilitates career development for human resource professionals across the United States and explores how HR positions add value to companies. Students finance associate degrees in human resources through scholarships, loans, grants, and work-study programs. Professional organizations, educational institutions, and private corporations often award scholarships to human resources students. The Society for Human Resource Management Foundation offers an annual scholarship competition for student members, and ExxonMobil maintains a scholarship program for students pursuing degrees in business, science, or technology. Also complete the FAFSA to see if you qualify for federal aid.